To explain a fact by a supernatural cause is to presuppose that there are facts with non-supernatural causes, but since God, theologically speaking, is the ultimate or first cause of everything that happens, then that is a merely tautological statement; to say that something happened because God wanted it to happen is to imply that other things may happen without God wanting them to, which is contradictory to the definition of God as omnipotent and as first cause. So I cannot understand how it is that a scientific investigation can be carried out upon such erroneous logical foundations by both those who accept the existence of the miraculous and those who do not. Now, why do these difficulties that I have just presented seldom or never appear to those discussing the subject? Because of the following reason: When one intends to investigate whether a fact is miraculous or not, what one usually does in the first place is to assign that fact to a class of similar facts whose origins are regarded as non-miraculous. Take, for instance, a man who has been cured of cancer. From the outset this fact is thus considered: “Here is Mr. John Doe, who is said to have been miraculously cured of cancer. There are, however, several people who have been non-miraculously cured of cancer.” You first fit that particular fact into the general class called “cure of cancer” and then proceed to investigate whether that cure in particular had supernatural origins or not. With that the miraculous fact is already predefined as non-miraculous, for it has already been placed under a class of similar phenomena which can be otherwise explained. If, having done so, you look for a miraculous cause for that fact, that is tantamount to looking for something where you have already established that it cannot be. So besides the methodological impediment, namely, the fact that the currently practiced natural sciences can only operate within boundaries defined by these sciences themselves and within which only what is mensurable — therefore “material” — can be observed besides this methodological difficulty, as I say, there is an intrinsic logical difficulty: the fact is being assigned to a species that by definition has been excluded from this sort of investigation. This, of course, will enormously hinder the progress of the investigation. This means that, if miraculous cures are regarded as though they were a subset of the set of cures which is not defined by the intervention of some miraculous element then the miraculous fact, under this aspect, is as banal a fact as any other with the difference that there might or might not also be the intervention of a miraculous element in it. The miracle, in this case, is severed from the very features that make it different from the other facts. Under this aspect, the only difference between a miraculous and a non-miraculous fact would be a cause, i.e., the difference would be in the cause, not in the phenomenon itself. But if a phenomenon belongs to the same order of other phenomena, it is almost impossible for us to identify in it some cause that is different from that which has been indicated for all the other phenomena of the same species. In other words, this sort of discussion generally occurs in an atmosphere of almost psychotic mental confusion. So what we would have to do, I mean, the most logical (or less infamous) way of investigating the phenomenon working on the assumption that we have received no direct revelation that clarifies it, working on the premise that we can investigate it solely with our natural lights, i.e., with the aid of the Holy Spirit but with no special revelation, what we would have to do, I say, is in the first place to see what it is that we are investigating; we have to try to delimit the miraculous phenomenon by its own characteristics and independently of its causes, for the causes would already be an explanation of the phenomenon, and how could we find an explanation for what we do not even know? The whole investigation of the miraculous has consisted exactly in investigating the causes of that which we do not know and which we have defined beforehand by the presence of these same causes. So, if we examine, albeit superficially, a single phenomenon acknowledged by the Catholic Church we have to delimit the territory in order to avoid additional difficulties, for there are, of course, innumerable miracles that the Church has not acknowledged as such or has not even got to know, if we take, I say, only those which are acknowledged by the Church as miraculous, we will observe in them some characteristics that distinguish them from any other facts, leaving aside the hypothesis of a supernatural cause. In other words, we do not need to investigate causes at all; either the phenomenon has a distinctive element in itself, independently of any consideration of its causes, or else there is not even a reason to investigate the miraculous phenomenon, since, in this case, it would not be distinct from any other non-miraculous fact. If there exists a reason to investigate miraculous facts, it is because there is in them some trait that already distinguishes them, independently of whether we know their causes or not. For instance, let us take the most unquestionable miracle of late, the miracle of Fatima, which I myself have studied very superficially. The first thing that we will notice is that this miracle is not composed of a single fact. It is not an atomistic fact like the case of a man who was ill and all of the sudden woke up cured, this would be regarded as an atomistic, isolated fact, one that could be considered in itself. What happened in Fatima was not an event, but rather a sequence of interconnected events pertaining to many different species and levels of reality. Firstly, the fact that three children had at the same time exactly the same vision of Our Lady, and upon the dates appointed, i.e., Our Lady fixed the dates when she would appear before the three, who went and saw her there. Secondly, the fact that they saw and heard, I mean, one of them saw, the other two heard exactly the same thing, i.e., the words were exactly the same. Thirdly, that vision contained a series of prophecies, i.e., predictions of things that would come to pass, marked by determinate signs, within a determinate period. For instance, the outbreak of a war on a world scale. [In other words], if we are to make a serious investigation concerning the phenomenon of miracles, we first have to ascertain whether there is in them, some distinctive trait that allows us to group them under a specific class without our appealing to the hypothesis of their causes. Here, as in every science, the definition of a phenomenon must be prior to the investigation of its causes. If we do not know the what, much less can we know the why. It is preposterous to include causes in the definition of any phenomenon whatsoever. So what we would have to do, in the first place, is a kind of phenomenology of the miraculous fact, by which we found, in a purely descriptive way, its distinctive characteristics, those features which allowed us to differentiate between this and other orders of facts. If we never found those characteristics, then it would be impossible for us to isolate a group of supposedly miraculous phenomena and to investigate their causes. 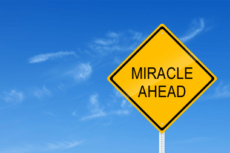 If miraculous phenomena are already placed beforehand in the order of non-miraculous phenomena, it is pointless to search for a miraculous cause for them. Moreover, if you predefine them rather by some cause than by characteristics of their own, then that which you wanted to investigate — the presence or absence of a miraculous cause — is already presupposed in the definition itself. This whole discussion is therefore logical mistake upon logical mistake. We have to investigate whether the order of phenomena held as miraculous has distinctive traits that we can grasp rather descriptively than explanatory. Thus isolating this set of phenomena from all others, they would become perfectly distinct. Once they have been distinguished, only then could we investigate their causes. In the necessarily superficial approach we have to adopt in this lecture, I would suggest that we examine one specific fact that is acknowledged by the Church as pertaining to the miraculous order. Millions of miracles take place, of course, that are not recognized by the Church or that the Church does not even get to know. But to avoid greater methodological difficulties, we should study only those which are accepted by the Church as facts of the miraculous order. Among them, the most remarkable one is evidently the miracle of Fatima. The first thing you will notice in the miracle of Fatima is that it is not a single, isolated, atomistic event, something that happens at a place at a certain moment. It is a sequence, almost a system, of facts that appears in such an interconnected and inseparable way that if you rule out one single of its elements, the whole story becomes meaningless at once. That phenomenon starts to happen when three children have a vision of the Virgin Mary, who sets up a series of meetings with them, comes back on the appointed dates, and imparts exactly the same message to them. The message contains some prophecies, with the approximate dates of what is to happen, along with the signs that will allow one to identify those facts just before they happen. There was announced, among other facts, a world war — the Second World War — which, said the Virgin Mary, the appearance of a strange light in the sky would portend, which indeed happened; shortly before the outbreak of World War II, there occurred over continental Europe a phenomenon like the aurora borealis, usually seen only further north — and soon afterwards the war broke out. Another phenomenon was the Communist Revolution in Russia. Another and even more recent one was the general apostasy among Christians, i.e., the dispersion of Christians, the creeping of an element of treason into the highest ranks of the Church — it all happened. Furthermore, on the date fixed by Our Lady, there was an extraordinary astronomical event that was called the “dance of the sun”; the sun moved in the sky before thousands of witnesses, and at the same time there was an outburst of miraculous cures among the sick who were there and in the surroundings. Besides, the dance of the sun was seen not only by those who were present at that place but also by others who were many miles away and did not know that a meeting between the children, the multitude, and Our Lady was taking place at that moment. Now, it is this set of events that is called the miracle of Fatima. It is not this thing or that thing. Any of those elements, it isolated, could be catalogued under a particular science and studied by its methods, but the whole set is inaccessible to the sum total of the sciences. Why? Because this set is what I have called a concrete fact — in truth, it is rather a concrete succession of facts. The succession is concrete in the sense that all facts evolve together, one fact leading to another and vice versa; the one is announced beforehand, the other bears in itself the seed of the next, which, in its turn, elucidates the first retroactively. Then I ask: Is there any science capable of investigating the relations between an astronomical phenomenon like the dance of the sun, the miraculous cures, the causes of World War II, the causes of the Russian Revolution, the phenomenon of those lights that appeared in the sky just before the war, and three children’s ability (or inability) of having a vision of Our Lady? Is there any science capable of studying that? Of course not. This phenomenon is inaccessible to the methods of any science whatsoever. And that is what makes it miraculous. We need not appeal to some “supernatural cause” explanation, we have not the least idea of what caused all this, and we need not have it; the phenomenon is miraculous in itself. Because of its own structure and internal constitution, it eludes the possibility of being apprehended explanatory by the human means of knowledge. We are not even capable of conceiving of a science that connects explanatory all those orders of phenomena at the same time. It simply checks human intelligence. A super-science? Some sort of thing that would blend astronomy, astrology, history, pathology, physiology — all these together? In order to explain the miracle of Fatima, we would need a science that is capable not of penetrating the facts that pertain to each of the sciences (facts abstractedly selected in accordance with their essential characteristics) but rather of penetrating the concrete fact. Now, some lectures ago, we saw that there is no science of concrete facts, and that there cannot be. Not even of one concrete fact. Take a simple fact: a guy, for instance, who killed another just around the corner. You can decompose this phenomenon into various aspects, you can have various sciences that study these aspects separately, but there is no science that joins them all, no science that can join them. You can, of course, unite those various pieces of knowledge in a technology: the police technique. But when I say to join, I mean it in the scientific sense: to find a common explanatory principle for all those aspects of the phenomena. There can be no such thing. There are no principles common to an astronomical phenomenon and the causes of a war. Even if it is assumed that you believe in astrology, astrologers, who have been studying this for millennia, are able to sometimes indicate coincidences between an astronomical and a terrestrial historical fact. A coincidence only, for which they have no explanation at all. But if you do not believe in astrology, things are even worse, for then you will lack the coincidence too. In the instance in a previous lecture I defined concrete fact as a fact considered in the successive and simultaneous convergence of all accidents that are necessary for it to be produced, for if a single accident is missing, the fact is not produced. For instance, the guy who killed another must have had some motive to do it — he killed to rob him, or out of passion, say, jealousy, or out of some interest, or out of revenge — some motive that can be traced in their history and, let us say, described psychologically. Besides, the offender must have used some instrument. Let us assume, for instance, that he shot the victim in the head, in which case the projectile traveled along a certain trajectory from the gun that was fired and struck the fellow’s head with a certain force. Both the trajectory and the impact are determined by certain physical laws. Is there any explanatory principle that is common to the motive of the crime and the trajectory of the projectile? No, there is not. There is only the convergence of two absolutely independent causal lines. Scientifically considered, these causes are independent and are, for this very reason, studied by different sciences. But in the order of the concrete fact, they are not independent, for it is precisely their convergence that determines the fact; if there had happened to be the one without the other, the crime would not have happened. Even if there was a motive for the crime and we know it perfectly well — we have investigated the criminal’s history, he has confessed the crime — even if we know it perfectly well, as I say, but the flight path was another one — the bullet hit the wall and the victim remained alive — still we have no means of connecting, in the causal sphere, the new trajectory of the bullet to the motive of the crime. In the field of the currently existing sciences, the motive of the crime and the trajectory of the bullet are not connectable rationally, only accidentally. Is there a science of accidentality? By nature, by definition, there is not. Now, the miraculous phenomenon, as, for that matter, any non-miraculous phenomenon, is always a concrete fact, and the concrete fact is composed precisely of a multitude of accidents that as such have no logical connection with one another. They have a factual, an accidental, so to speak, connection, and there is no science of the accidental connections between thousands of independent causal lines. Now, the miraculous phenomenon is distinguished from other phenomena precisely by this kind of confluence of several causal lines, and not by the presence of some cause in particular. The miraculous phenomenon happens precisely in such a way that those accidental connections are, so to speak, already presented to view in the central fact itself of the miraculous set. Who connected those various orders of phenomena? Who connected the dance of the sun with the outbreak of World War II and of the Russian Revolution and with the miraculous cures? Our Lady herself did. She said that this would happen and she was making it happen. In other words, the connections between the several lines present of accidentality and causality are already clarified, laid open to view, in the phenomenon itself. The miraculous phenomenon, somehow, has a transparency that the ordinary phenomenon does not have. It is as if something of the very structure of reality exhibited itself in it in a simultaneous manner, something that cannot appear in the phenomena of everyday life, let alone in the phenomena investigated by what are called sciences. The fact in whose very structure we cannot identify the clarity of this connection — in its very structure, i.e., without taking causes into account — this fact, as I say, has to be excluded from the miraculous order. . . .
What, in their turn, do the sciences do? Having certain observed facts as their point of departure, they search out a rational explanation, description, or articulation for them. What is it then to study scientifically an observed fact? It is to frame a real fact within the order, or structure, of possibility. That is to say, the existence of the structure of possibility is a presupposition of scientific activity itself. The structure of possibility, however, is independent of the existence of any real fact. The laws of elementary logic as well as the laws of elementary arithmetic are independent of even the existence of the cosmos. The fact that one plus one is two is independent of the existence of the whole universe; in any possible universe one plus one would necessarily have to be two. The structure of logic and elementary arithmetic are the structure of universal possibility. The universal possibility is exactly what, theologically, is divine omnipotence. We know that in reality, in the actually existing cosmos, not every possibility, not all that is possible, is actualized. We know, too, that all that happens, all that is actualized, is possible. So what does science do? To give a logical explanation for a fact is to frame this fact within the order of possibility, within the structure of possibility. Facts, i.e., the world of pure experience, the empirical world, is in itself opaque. It is only made rationally intelligible when framed within the possibility. When you connect two things by saying that the one was caused by the other, you connect the factual order to the causal order. And what is the causal order? It is the structure of possibility. Now, the structure of universal possibility is independent of and prior to any event whatsoever. It is, so to speak, eternal. This means that if the structure of possibility did not exist, no scientific study of anything whatsoever would ever be possible. We would be more or less like animals capable of receiving facts but not of grasping their logical connections. Animals may well grasp atomistic logical connections, but, unlike us, they cannot have a system, a structure of rational explanation. This structure is nothing but the very order of possibility, considered not in its totality — which for us is impossible — but rather within certain boundaries that are accessible to us. Now, when we fit facts that are regarded as miraculous into an order of non-miraculous facts and say that the former are distinguished from the latter solely by the inference of some cause this means that a different cause would have brought about the selfsame thing. Take, for instance, two people who have been cured of cancer: the one by known biochemical means; the other by a miracle. In the one case, the intervening factor would have been medicine; in the other, it would have been God. In other words, both the natural and the supernatural cause would have brought about exactly the same thing. In the first place, however, we would have to explain how it is that specifically different causes can bring about exactly the same thing — this kind of study is absolutely infeasible. That is why I say we would have to begin with a phenomenology of the miraculous fact; the miraculous fact, then, would have to be differentiated from all other facts by its visible structure itself, independently of any consideration of its causes. Now, when will we find a scientific explanation of the cause of the miraculous phenomenon? Never, never, never, never, never. Not because of some limitation of our knowledge, but because of the very structure of the miraculous fact and because of the structure of what we call science. . . . If there is no science of the concrete fact and if the miraculous fact is only distinguished from all other facts precisely by its structure as a concrete fact, then the miraculous fact lies eternally outside the domain of science. Moreover, while the miraculous fact is inaccessible to us through an explanation, it brings with itself and, by its very presence, immediately shows us those connections between orders of causes which we cannot usually see. In a certain manner it has an intelligibility of its own, which non-miraculous facts do not. In the miracle of Fatima, for instance, the vision that the children had — the miraculous cures, the lights that appeared in the sky, the dance of the sun, the Russian Revolution, World War II — all this is shown as bearing internal connections, which we usually fail to see. This means that the miraculous event cannot be explained in itself, yet by itself and its own material structure it throws light on causal connections that we cannot usually see. So, in a certain manner, the inexplicable miraculous event has a force — I would say not an explicative but an illuminative force — that allows us then to see connections that before we did not. In this sense, the miraculous fact has the structure of what in other domains is called a symbol. Symbol was defined by the philosopher Susanne K. Langer — one of the finest scholars in this field — as the matrix of all intellection. That is to say, a symbol is not something that you understand in itself, but something that helps you to understand a number of other things. Take, for instance, the biblical narratives. Many times you do not understand what is going on there, but later on, as you start to find facts in real life analogous to the facts in the narratives, the observed facts become intelligible, thanks to the unifying power of symbols; several facts are joined under a species that is condensed into the symbol. That is exactly what the miraculous fact does; we do not understand it, but it throws light on innumerable causal connections that are usually not visible to us. This characteristic is proper to the miraculous phenomenon. Any phenomenon, of course, if regarded in a certain manner, can be symbolic, but the fact regarded as miraculous already has a symbolic structure in itself, and it is inseparable from this symbolic structure. It is this inseparability of its presence from its symbolic character that is the distinctive feature of the miraculous phenomenon. In the first instance, it is not the miracle that has to be understood. Rather it is everything else that has to be understood in the light of the miracle. Each and every fact may be regarded symbolically, but the miracle has to be so. It does not admit of being looked on otherwise. Why? Because it is the nature of the miracle to physically show those connections between several causal orders which usually do not appear to us, and that is precisely what symbols do. Do you understand this? Seen in this manner, the miraculous fact does not have to be explained, because the miraculous fact is the source of all explanation; it is the miraculous fact that throws light on all the rest. And that is precisely whence its name — miraculum — comes: something worthy of being looked at, worthy of being contemplated. So what Aristotle said about rites of mysteries in general also applies to miracles: they teach us nothing, but leave a deep impression upon us (these are not Aristotle’s words, but my own way of putting it) that acts like a vitamin, so to speak, upon our intelligence. He thus anticipated Susanne K. Langer’s definition of symbol as the matrix of all intellection. A miracle is not to be explained in itself but to be contemplated (distinguished, obviously enough, from other phenomena) and to be used thereafter as a matrix for the understanding of many things that are happening at that same time and that are to happen from that time on. The miraculous phenomenon has characteristics that no other phenomenon does. One of these characteristics is that it cannot be understood in itself, i.e., it cannot be explanatory comprehended in itself, but it throws some light on other facts. This is the true criterion for the study of miraculous facts. Olavo de Carvalho is a Brazilian essayist whose interests include historical philosophy, the history of revolutionary movements, Kremlinology, the traditionalist school, comparative religion, psychology, and philosophical anthropology.